Jade is a general term, applied for denotation of two different minerals, carpentry stone - nephrite and jade, jadeite. 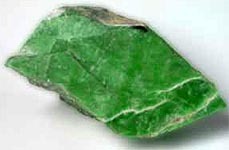 Outwardly a nephrite looks like jade, jadeite (by sight differs from a nephrite character of the treated surface). 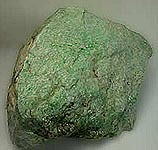 From the mineralogical point of view both minerals are compounds of silica and chemically very similar, only as admixtures compounds of magnesium come forward in a nephrite, ferrous iron, nickel, chrome and vanadium, and in jade, jadeite are compounds of sodium. 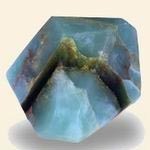 For a nephrite clean, bright, green tones, incident to jade, jadeite and related to included of chrome in his crystalline structure, are not characteristic. There are jade, jadeite whitish, rose, violet and even dark blue colors. 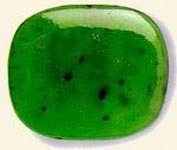 At weathering in nature jade, jadeite желтеет from oxidization of ferrous iron. 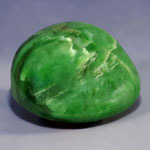 Jadeite and nephrite began to divide only after opening of New Light. On territory sew on the countries of jade, jadeite began to drive recently enough, but in the world jade, jadeite is very popular already a long ago, because they cleaner by a color and more transparent than nephrite. Jadeite knows was humanity from deep antiquity. As early as stone century he was used for making of weapon and different economic instruments. Later he began to be widely used for treatment at making of jeweller and artistic wares, especially in Central America. If there are doubts, it is better to rotin a stone specialist. 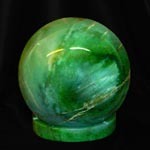 The well well-educated crystals of jade, jadeite meet extraordinarily rarely. Usually he is observed as thin-, middle- to the coarse-grained aggregates. Transparency of jade, jadeite can be different: from semilucent (most short-grained) and translucent in thin chip split to most often meeting - opaque. Abroad the basic district of booty of jade, jadeite are north districts of Burma. Most valuable is a sort imperial. Prices on him commensurable with prices on emeralds. 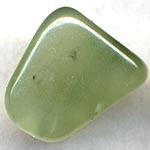 Greater part of jade, jadeite is for a sale in an untilled kind. Treatment of him is made mainly in China (Asia) and in less degree in Hong Kong. From jade, jadeite do rings, bangles, pendants, brooches, different fretted souvenir and artistic wares. 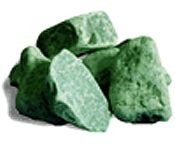 Jadeite with the inexpressive colouring sometimes exposed to the ennoblement by tinting organic dyes. It can be remote a tampon, moistened in an aquafortis. 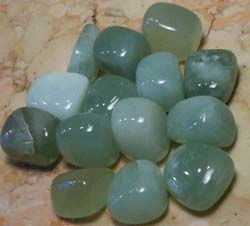 Treated jade, jadeite can be distinguished from the nephrite of the surface polished in grain. Minerals have a different microstructure: nephrite - confusingly-fibred, jade, jadeite - grainy, that results in formation of characteristic pecky "shagreen" surface at the polish of jade, jadeite (reminds an orange-peel). Nephritis (jade) has a smooth homogeneous waxen surface as-polished. A closeness and indexes of refraction of nephrite below, than jade, jadeite (jade, jadeite can glance (glitter, glare) unlike a mat nephrite). But these stone are very alike in principle.